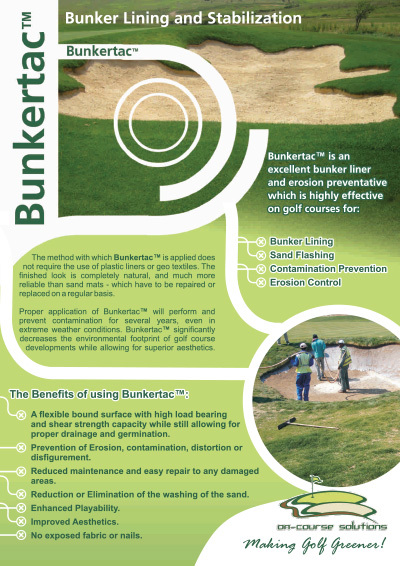 Bunkertac is a special purpose binding agent, specifically formulated for soil and sand stabilization. The key to the exceptional performance of Bunkertac is its ability to cross bond and solidify the soil or sand particles. When used for bunkers, Bunkertac will meet the requirements of a flexible bound surface with a high load bearing and shear strength capacity while allowing for drainage, prevent distortion and disfiguration of the bunkers shape, prevent contamination of the sand contained in the bunker and most importantly reduce initial application, repair and maintenance costs. When used for sand flashing, Bunkertac will actually hold the sand in place all throughout the bunker most specifically on the face and along the edges thus improving the aesthetics and ensuring that the original intended design of the bunker has been met. Bunkertac is completely environmentally friendly, safe for animals, wildlife and vegetation and dries clear and transparent, leaving the environment in its natural state. As a result it will significantly decrease the environmental footprint of golf course developments, while at the same time allowing for superior treatment of several areas and significant cost reductions on initial installation and future maintenance. We have demonstrated significant savings when compared to traditional methods of sand matting. Providing a flexible bound surface with high load bearing and shear strength capacity while still allowing for proper drainage and germination. Bunkertac is completely environmentally friendly, safe for animals, wildlife and vegetation and dries clear and transparent; leaving the environment in its natural state. Bunkertac meets all ISO 14001 requirements thus helping to keep all companies involved compliant. 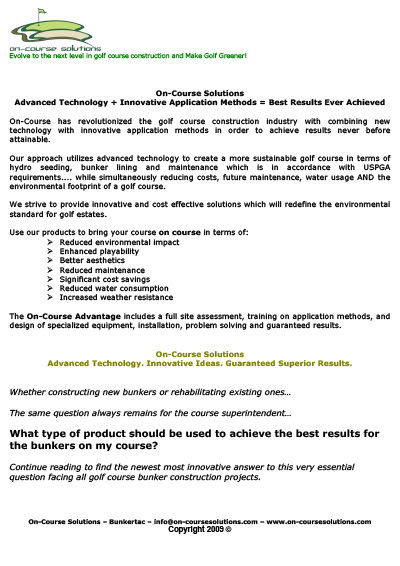 What makes Bunkertac a cost effective solution? Bunkertac is a cost effective solution since it is less expensive, easier to install, easier to repair, requires less maintenance and out performs any competitive product on the market. Will Bunkertac harm the grass surrounding the bunker if over sprayed? Bunkertac will not harm the grass surrounding the bunker it will actually enhance the grass growth around the bunker. Over spray will actually help prevent further contamination. Will the use of Bunkertac reduce future maintenance? Future maintenance will be significantly reduced as the Bunkertac application will prevent or reduce contamination, washing and erosion of the sand while improving drainage and holding the sand in place on the face; thus eliminating the need for constant raking and pushing of the sand back into place. What is the longevity of Bunkertac? The Bunkertac application will last a minimum of 3-4 years if applied according to On-Course Solution’s Bunker Stabilization & Sand Flashing Instructions and the After Treatment & Maintenance Instructions are followed. Will Bunkertac enhance the playability of the bunker? The Bunkertac application followed by the placement of the USGA recommended amount of sand will reduce the chances of a “ball-lie” or “fried egg” and improve the shot value; thus enhancing the playability of the bunker. Will Bunkertac hold the sand in place on steep faces and edges? The Bunkertac application process including our specialized method for the sand flashing is purposely designed to ensure the sand is held in place on the steepest of faces and edges. When preparing the bunker when is it best to complete the compaction? If possible it is best to compact the bunker 3-4 days prior to application of the Bunkertac to give the soil a chance to relax before application. Is pre-wetting of the bunker necessary? Does it make a difference what size hose is used to apply Bunkertac? A 1 inch or 25mm diameter hose is the best size hose to use for the application of Bunkertac in order to ensure proper flow rates and to meet the specified application rate. What is the recommended application rate for Bunkertac? What is the best ratio of Bunkertac to water to use? When preparing the dilution should the water or Bunkertac be added first? How many coats of Bunkertac should be applied? How long must I wait between coats of Bunkertac? Each coat of Bunkertac must be given sufficient time to penetrate and become tacky before application of the next coat in order to avoid developing an under performing skin layer rather than the desired penetrating layer. This can be anywhere between 1 and 24 hours depending on conditions. After application how long must the bunker remain free from watering and traffic? After Bunkertac application the bunker must remain free of watering and traffic for a minimum of 24 hours. During winter months this must be increased to 48 to 72 hours. When and how often should sand be dusted over the treated area? Sand should be dusted simultaneously or immediately following each coat of Bunkertac then the USGA recommended amount of sand placed in the bunker. What is the best method for dusting of the sand? The best method for dusting of the sand is to use a knapsack type duster blower.